Two equites are depicted here, who can be identified by their sleeveless tunics, which were belted at the waist and ended just above the knees. As can be seen, the lower legs are wrapped (rather than protected by greaves) and there is a manica on the right arm. The visored helmet has a straight brim and decorated with two feathers. A small round shield was carried, as well as a short sword and lance. Isidore of Seville (Etymologies, XVIII.53) says that the equites were the first to compete in the gladiatorial games, after the military standards had entered the arena. Wearing small gilded helmets and carrying light weapons, they rode white horses, although they invariably are shown having dismounted and fighting on foot. For this reason, equites competed only against their own kind. It was the lanista who provided his troupe of gladiators for sale or hire to the producer of the show. A reviled figure in Roman literature, compared by Martial with libelous informers and liars, the lanista was infamis and regarded as both a butcher (lanius) and a pimp (leno), because he traded in humans for profit. That having been said, Cicero congratulates Atticus on his troupe of gladiators, which he purchased in 56 BC, and exclaims that he could recover the cost of his investment in only two contests (Ad Atticum, VIII.2). Although variously identified as a referee, judge, or umpire, the figure with the rod (rudis) also has been understood to be the lanista. 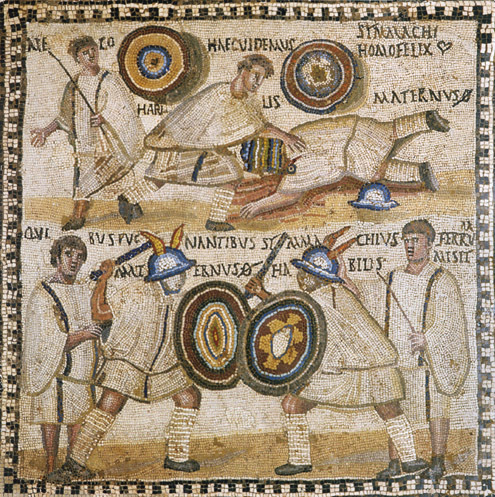 This mosaic is one of a pair (the other depicts a retiarius and secutor) that were found on the Via Appia. Dating from the end of the third century AD or beginning of the fourth, they both are in the Museo Arqueológico Nacional (Madrid). Reference: Das Spiel mit dem Tod: So Kämpften Roms Gladiatoren (2000) by Marcus Junkelmann; "Familia Gladiatoria: The Heroes of the Amphitheater" by Marcus Junkelman, in Gladiators and Caesars (2000) edited by Eckart Köhne and Cornelia Ewigleben; The Colosseum (2000) edited by Ada Gabucci; Cicero: Letters to Atticus (1999) translated by D. R. Shackleton Bailey (Loeb Classical Library); The Etymologies of Isidore of Seville (2006) by Stephen A. Barney, W. J. Lewis, J. A. Beach, and Oliver Berghof.